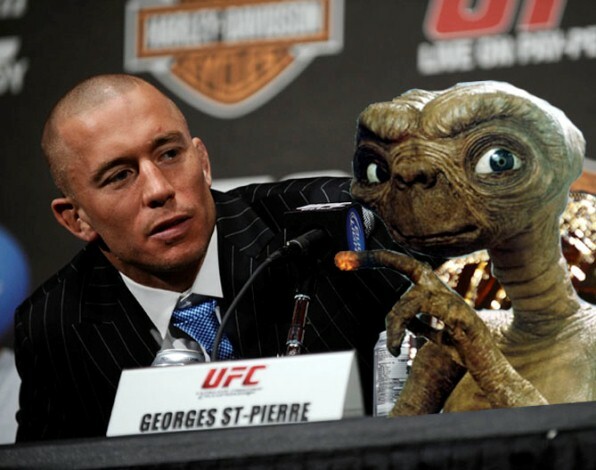 Was Georges St. Pierre (GSP) Really Abducted By Aliens? The story about Georges St. Pierre (GSP) being abducted by aliens first seeped into the consciousness of the mixed martial arts community when the Canadian champion appeared on the Joe Rogan Experience (JRE) podcast on April 23, 2013. During the podcast, the discussion segued into alien topics when Rogan asked St. Pierre if he's afraid of aliens. What followed was a nearly 20-minute segment wherein Rogan and his co-host Brian Redban queried St. Pierre about his supposed alien experiences. St. Pierre was initially hesitant on talking about his otherworldly experiences but he opened up as Rogan tried to dig up more information from him. To be fair to St. Pierre, he didn't say nor claim that he was abducted by aliens. He merely mentioned his strange experiences like missing time. You can go watch the JRE episode yourself but to save you some time, here's the highlights of the section where Rogan, Redban, and St. Pierre talked about aliens. 1. St. Pierre says he is afraid of a lot of things and these include aliens. 2. He says he's not sure about his experiences. He answers "I don't know" to a lot of Rogan's questions. 3. His experiences are mostly characterized by missing time. In St. Pierre's words: "Sometimes, I'm looking at the clock and it's like I wake up and I look at the clock right after..it's like the clock advanced like four hours or two hours. There's a timezone that I don't remember what happened." 4. He says it also happens while he's driving: "I'm driving my car during the day and it also happens. I'm going somewhere then I look and two hours has passed. Two hours just passed. Like this." 5. He denies having any memory of interactions with alien beings. He doesn't remember green things doing something to his body. 6. His experiences don't involve encounters with Unidentified Flying Objects (UFOs). He wasn't taken aboard any flying object. 7. He says the experiences have been going on since he was a kid. 8. He has a hard time talking about his experiences in public because they sound crazy. In 2014, St. Pierre appeared on Chael Sonnen's podcast, You're Welcome! Sonnen prodded the Canadian about his alien experiences which prompted him to elaborate and more. In the podcast, St. Pierre told a story about how him, Rashad Evans, Mike Van Arsdale, and a couple of other guys encountered an Unidentified Flying Object (UFO) at a highway in New Mexico. In another episode of the podcast, Sonnen had Evans as a guest and the former pretty much confirmed St. Pierre's UFO sighting tale. In the words of Rashad Evans: "We’re driving down the highway, the mountains are west of us. The sun was setting, it was getting pretty dark. And we’re driving—Mike van Arsdale, Ali Abdel-Aziz, this Mexican guy who couldn't speak any english… his name was Alejandro and he came down to train with us for a while. We’re amidst discussion, you know, busting each other’s chops and we look over and we’re like, ‘Yo what is that! and it just lit up the whole sky. It lit up the whole sky! And everybody in traffic starts to look at it and everybody’s, like, driving slow… everybody slowed down… everybody was looking. And then it just took off in a bolt of light. [makes spaceship sounds] It was super slow, then it took off like a bolt of light and it out was of view… The funny thing is Georges is already scared of UFOs, before that… he was staying at Greg Jackson’s house, and the room he was staying in Greg Jackson’s, it had a skylight in the room…you could see outside… And Georges was scared the whole night that a UFO was going to beam him up." In the lead-up to his fight with St. Pierre, Michael Bisping has used the St. Pierre alien abduction story as a joke during interviews and press conferences. Here's one: "I’m going to remind him why he retired. Johny Hendricks beat him so bad, he thought he was f*cking abducted by aliens. That’s why Georges retired. You know this. Everybody knows this. And he’s going to walk in there and come find out. It’s easy, me now talking to you, and it’s easy for Georges, talking to you, doing TV, doing the Countdown, doing all of this. But you can’t lie to yourself."